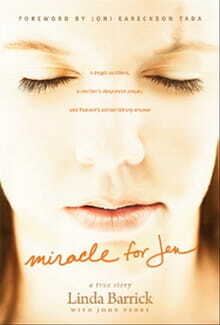 EDITOR'S NOTE: The following is an excerpt from Miracle for Jen by Linda Barrick (Tyndale House). Lord, this life that I now live is not mine but Yours. It is Yours to do with it as You please. . . . Take this year and my life and allow Your glory to shine! Take it and use it to its fullest potential. My cell phone was ringing. My brain reacted automatically. I knew I should reach down to-ward my feet and fish the phone out of my purse. But my body wasn’t moving. I had no feeling anywhere, only a sensation of being restricted as if I were wrapped in a steel blanket. I opened my eyes. My face was smashed against a windshield of crushed glass. How did I get here? Is this a dream? Wasn’t I just sitting with my husband and son watching our fifteen-year-old, Jen, sing in the choir at her school’s fall concert? I reached down with my right hand to touch my leg, and when I lifted my hand up again it was covered with blood. This can’t be real. Lord, please wake me up! He was in shock and didn’t answer any of our questions, but at least he was alive. Jen remained silent and still in the seat behind Andy’s. As a mom, I wanted with every molecule inside me to hug Josh and touch him and make him feel better. I wanted to hold Jen in my arms and tell her that I loved her. But I couldn’t move. The crushed metal and broken glass encased my body like a giant, sin-ister glove. The only thing I could do was pray. Only an hour earlier, I had been sitting in our church sanctuary as music washed over the audience in waves, filling the room with sounds of praise and the pulsing energy of young hearts on fire for Christ. Of all the singers from Liberty Christian Academy onstage that night, one stood out especially to me: a beautiful, auburn-haired sophomore who seemed transformed by the words and music sur-rounding her, completely focused on conveying her passion for Christ to the audience. Maybe it was because the video monitors flanking the stage kept showing her face, beaming with enthusi-asm. Maybe it was because she was on the end of a row and had room to move a little, while most of the students stood shoulder to shoulder on banks of risers. Or maybe it was because I’m her mother. Jennifer had been anticipating this fall concert for weeks, looking forward to the privilege of singing in the Sunday night church ser-vice for more than three thousand people. It was her first perfor-mance with the high school choir, and Jen always loved new expe-riences. I was a little surprised she wanted to be in the group since, for all her many gifts and talents, Jen did not have what I’d call a fabulous voice. God had blessed her in so many other ways—she was a straight-A honor student, varsity soccer player, and nationally ranked varsity cheerleader—and she hadn’t seemed that interested in choir before. However, in typical Jen fashion, what she lacked in natural ability she made up for in en-thusiasm and hard work. Sophomore year was shaping up to be her best yet, part of an incredible season of transformation taking place right in front of me. It seemed like just yesterday she was running around in a baseball cap and mud-stained clothes, spitting sunflower seeds. I would often have to beg her to comb her hair. Now she was blos-soming into a beautiful young lady. The braces had come off after two years, revealing a dazzling new smile. Just recently she’d got-ten her first formal dress to wear to the junior-senior banquet. I’d scarcely recognized the glamorous, elegant woman who had come out of Jen’s bedroom when her date arrived to pick her up. Only two nights before the concert I’d been at the football game to watch her cheer. She was so exuberant and full of life, going all out with every jump like she always did, her face glowing with energy and excitement. Now here she was onstage, just as intent on doing her best with the choir as she was with the soccer team or the cheering squad. I could not have been more proud of my precious ­daughter. Her life seemed almost perfect! Music was good for Jen because it was a fresh way to express her faith. She was such a friendly, popular girl, yet all her life she had held her thoughts inside. Spiritually and emotionally she was a very private person. She didn’t talk much to me or to anybody else about what was on her mind and heart. As deeply committed to Christ as Jen was, and as much as she wanted her friends to know Christ the way she did, it wasn’t a natural thing for her to witness one-on-one. When her youth group went door-to-door sharing God’s love with strangers, she was always the one standing quietly in back, never saying a word. In fact, one of my prayers for Jen that year had been for boldness. She’d asked me to pray for her to find a way to express her private relationship with God out loud. Music gave her a tool to shout out her love. That’s why I think she sang with a special radiance that night at her musical debut. The song she was performing heightened her sense of excitement even more. “Lord, You’re Holy” was one of her favorites, especially the part in the middle where the choir takes the lead, describing the unbelievable, unfathomable depth and richness of God’s love. She’d sung those lyrics around the house all week. Lord, the only way I feel worthy to sing this song is on my face before You! This song can’t even describe You to Your true fullness! Mere words cannot express You! Lord, I love this song b/c it helps put things in perspective! It lifts Your name on high! You are worthy of all my praise! And the only one deserving all my worship! The music rocked to a big finish. Before the last note sounded, the audience of parents, friends, and church members rose as one, their cheers and applause roaring through the spacious sanctuary of Thomas Road Baptist Church, home of Liberty Christian Academy and partners in ministry with Liberty University, where my husband, Andy, was director of alumni relations. He was beside me in the audience that night, along with our son, eleven-year-old Josh. Like his dad, Josh loved sports and would probably not have put a choir concert first on his list of favorites for a family outing. But he obviously enjoyed seeing his sister onstage. Andy and Josh had slipped into the performance just in time. Jen and I came to church by ourselves that afternoon because the guys were on their way home from a baseball tournament Josh played over the weekend. They were with our friend Dr. Tim Clinton and his son, Zach, who was also in the tournament. Tim’s daughter, Megan, sang in the concert that night too, so the ball-players stopped by our house for a quick shower and then came to church in Tim’s car. That way Andy, our kids, and I would be able to ride home together. It would be great to spend the time catching up on each other’s adventures. Besides, as Andy knew, I hated driving in the dark. Once the applause tapered off and the crowd sat down, the speak-er for the evening took his place at the lectern. My father, Dr. Ed Hindson, preached that night on prophecy. I’ve heard Dad, a dis-tinguished professor at Liberty University, speak thousands of times since I was a little girl. His insights, based on years of study and teaching from the book of Revelation, have inspired untold numbers of people. On this particular night, I sensed that his preaching was especially anointed. By the end of his sermon the entire audience seemed stirred. More than a hundred came forward to pray. After the closing prayer, the audience stood, buzzing with pent-up energy and moving toward the exits. Outside it was crystal clear with an autumn snap in the air, unseasonably cold for early November in Virginia. Josh wore only a T-shirt and jeans, but we’d be home in no time so it didn’t really matter. Heading toward the parking lot, Andy and I made a point of reminding several couples that they were invited to our house for an impromptu postconcert supper and to watch football on TV. I saw Jen talking—let’s be honest, flirting—with her boyfriend, Brandon. Curly-haired and blue-eyed, he was a handsome young man. He was a senior and had just turned eighteen, which initially had my motherly antennae on high alert. However, over the months they’d been dating he had proven himself to be a Christian gentleman in every way. I’d even relaxed my “no riding with teenage drivers” rule to let Jen ride with him. Since the rest of his family would be coming to our house in a few minutes anyway, I decided to let him drive her home. “Did you drive tonight?” I asked him. For a second I considered letting Jen go with the Knight family. Then I realized that between Josh’s baseball and Jen’s cheerleading events, it had been three weeks since we’d been in the car at the same time. So I didn’t offer. I was looking forward to the four of us being together again, even for the short trip home. We climbed into our 2003 Toyota van with Andy at the wheel, me beside him, Jen behind Andy, and Josh behind me. Some of our company would probably beat us home, but that was okay; they could talk in the yard for five minutes until we got there. We were expecting my parents, Andy’s mom and dad, Andy’s brother, John, and his two kids, Brandon and his family, and our friends Robb and Paula Egel. Ever the thoughtful husband, Andy suggested we swing by KFC for fried chicken instead of trying to whip up something so late at the house. The kids added their “yes” votes from the backseat, and I wasn’t going to turn down a trouble-free party dinner with no dishes afterward. We had to go a little out of our way to get the food, so we didn’t take the usual route home from church. Andy parked and went in to pick up our order while the rest of us waited in the van. After what seemed like a long time, Josh asked if he could go inside to see what the holdup was. I said he could and he jumped out, ignoring the cold despite his thin T-shirt, and walked purposefully inside as only an eleven-year-old going to check on his father can do. In another five minutes, my two men came back carrying their bounty: four big buckets of just-fried KFC. Andy put his two on the floor beside me, and Josh put his on the seat between him and Jen. She was busily texting Brandon, despite the fact that she had seen him ten minutes before and expected to see him again in another five. I could feel the heat from the containers at my feet. Our meal would still be piping hot by the time we arrived home. Andy turned onto Waterlick Road, a narrow, two-lane street we both traveled dozens of times a week that ran within a mile of the house. It was an old-fashioned country lane with open drainage ditches on both sides, leaving scarcely a car width of shoulder between pavement and drop-off. I’d noticed those ditches in the past—the neighborhood was outgrowing its old rural roads—but didn’t give them a moment’s thought now. It was a quiet, clear Sunday night, the moon etched bright against the dark sky. Not much traffic. I was thinking ahead to a house full of friends and warm fellow-ship only a few turns away. I’d put on some coffee, and Andy would get the fire going in the fireplace and turn on the football game. Josh was eager to tell us about his big plays at the baseball tournament and how they won the championship game. The in-laws looked forward to a visit with each other, and we’d all celebrate a wonderful concert and an inspired sermon. But that’s not what happened. Jen didn’t see Brandon, Josh didn’t tell us about his ball game, Andy and I didn’t visit with our friends, and no one ate any chicken. Instead, within a matter of seconds, our lives would change forever. As we were all sitting in church watching Jennifer sing, a man I’ll call “Carl Johnson,” though that isn’t his real name, was sitting in a restaurant across town ordering one drink after another. Carl was twenty-six and had a long history of drinking and driving. In fact, on that night he didn’t have a valid driver’s license or auto insurance. Since Carl had more than twenty traffic violations, his license had been revoked. He had been convicted twice for DUI and arrested for a third, which upon conviction would mean mandatory jail time. That charge was still pending; otherwise, Carl would have been locked up and off the street that night. Carl paid for his drinks and staggered outside to his 1979 Chevy truck. He stabbed his key at the ignition switch, started the en-gine, and careened onto Timberlake Road, barely missing other cars that honked and swerved to get out of the way. Within seconds he was barreling down the road and sideswiped a Ford Explorer going in the same direction. Fortunately, that driver, whom I’ll call Don, had seen Carl in his rearview mirror and prepared as much as possible in the split second before impact. He corrected the skid and followed Carl, call-ing 911 as he drove. We later learned from state police reports that Carl’s blood ­alcohol level measured 0.33 percent at the crash site, four times the legal threshold for driving after drinking. Don’s mother and girlfriend, passengers in the SUV, began to pray that God would protect whomever was down the road as the battered pickup raced away. The next victim might not be so fortunate. Don followed Carl onto a residential dead-end street. After a mi-nute, Carl made a U-turn and drove back to the intersection of Highway 811 and Waterlick Road. He passed out at the wheel and sat through several green lights. The truck was still running and in gear, with only Carl’s foot on the brake to keep it from drifting out into the middle of the intersection. It had been over twenty minutes since Don had first called 911, and he wondered what he should do. Finally, a police officer arrived on the scene and quickly opened the pickup door. He reported seeing a white male subject with his head on the steering wheel and a strong smell of alcohol coming from the vehicle. The officer depressed the parking brake and woke Carl up. He then ordered him to put the truck in park, turn off the ignition, and hand him some identification. Don, still on the line with the 911 dispatcher, reported that the man was getting out of his truck. “So he’s talking to the deputy now?” the dispatcher asked. After a couple of minutes, the officer ordered Carl to get back in-side his truck and stay there. Not a day goes by that my mind doesn’t revisit that moment. Why didn’t the officer handcuff Carl and lock him in the back of his cruiser? Or at the very least, take his keys? Obviously the suspect was drunk out of his mind. Had the policeman stopped him from driving anymore, the future for the Barrick family would have turned out very differently. Having told the reckless driver to stay put, the officer walked over to the Explorer to get Don’s account of the incident. He stood at the driver’s side window while Don began his statement, then stepped back to wave a passing car around. Suddenly, Carl fired up the engine of his truck and sped away with a squeal of tires and burning rubber. He ran through the light at 811 and headed back up Waterlick Road—going eighty miles an hour, with his headlights off in the dark night. If we hadn’t been to the concert that night, hadn’t decided to stop for chicken, or hadn’t had to wait longer than usual for our order, we would not have been driving down Waterlick Road at that moment. But there we were, headed in the opposite direction from Carl about three-fourths of a mile from home. Just minutes earlier on his way to our house, Andy’s brother, John, had actually seen Carl’s pickup, lights off, sitting through a green light. He fig-ured some poor guy had dropped something on the floor of his car and was reaching down to get it. Now John, with his children Amanda and Andrew, was in our driveway with our other guests waiting for us to get there with the house key and the chicken. Andy slowed the van to take the familiar curve just before the intersection of Waterlick and 811, where we would turn left to go into our neighborhood. I had turned around toward the backseat and was talking to Jen, who was a little nervous that Brandon’s whole family was coming to our house for the first time. She was calling a neighborhood girlfriend named Kelsey to invite her to the party as well. I heard no impact, felt no collision, no pain, nothing. The world simply went black. Visit Tyndale online at www.tyndale.com. Visit the Barrick family website at www.miracleforjen.com and ministry website at www.hopeoutloud.com. TYNDALE and Tyndale’s quill logo are registered trademarks of Tyndale House Publishers, Inc. Copyright © 2012 by Linda Barrick. All rights reserved.